It’s Friday and we’re wrapping up the week with an event full of whimsical fun! Today we’re going to spread our wings and fly… straight into Pixie Hollow. Tinker Bell and her friends have gathered for a birthday celebration! 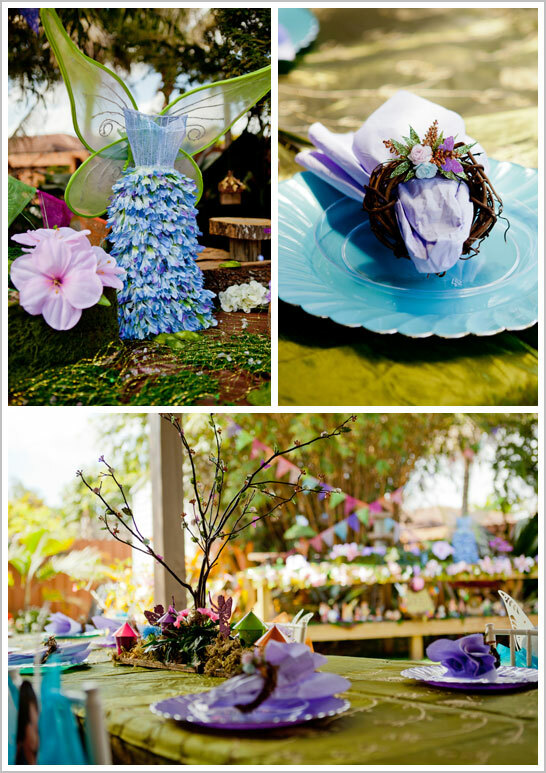 Maylene of Malu Boutiques took her daughter’s love of Tinker Bell and brought this magical land of fairies to life. Join us as we explore the beautiful meadows filled with flowers, sweet treats and fluttering fairies… it’s a Pixie Hollow Birthday Party! 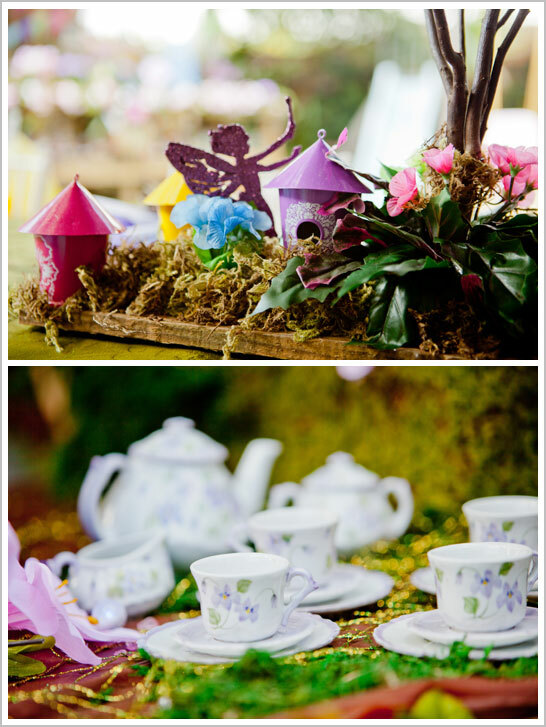 Tree stumps, moss and glitter unite to create the perfect scene for a pixie party! Little guests were given wands and wings upon arrival. The sweets table was overflowing with goodies! Macarons topped with fondant flowers, cake pops, apple tarts, chocolate covered oreos, cupcakes, cookies and an adorable fairy house cake. Guests also enjoyed push pops filled with homemade guava and banana mousse. 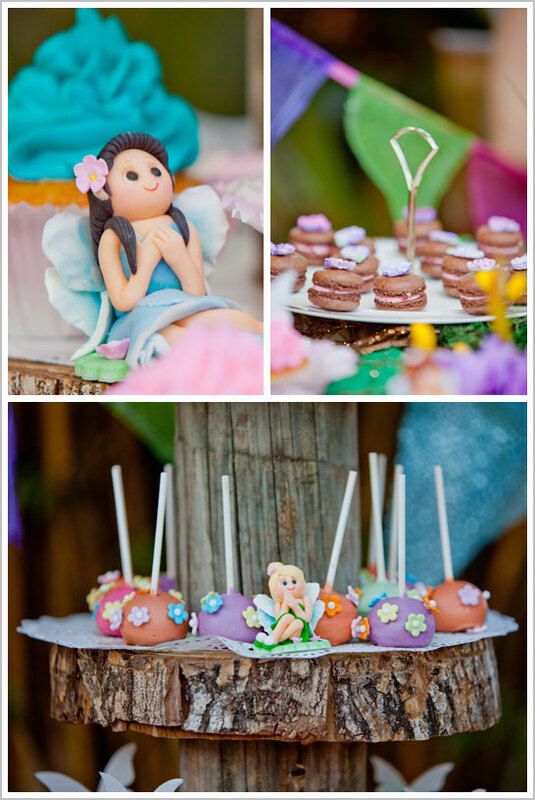 And making an appearance throughout the sweets table… the most adorable fondant fairies! The detail on these little ladies, created by Mimi café Union, is incredible! And of course, nothing is as sweet as the birthday girl herself. All dressed up in a frilly Tinker Bell tutu with the most adorable little shoes! “My daughter loves the princesses but her favorite is Tinkerbell. She stays so quiet while watching her movies (If you knew Sam you would know what I mean. She turned 3 going on 20. She can talk you ear off). We wanted to recreate a Pixie Hollow theme so that she could feel as if she was there. The entrance was adorned with real tree trunks where Sam’s scrapbook was placed that way everyone could sign it as well as pick up their wands and wings so that once they would walk in they could be ready for pixie hollow. My husband’s work bench was used to create Pixie Hollow with all the fairies, flowers, animals, tree trunks, and of course the food and goodies. The girl’s table had a forest look with the tree centerpiece being the focal point each of the chairs had an organza bow with a different fairy attached except, for the birthday girl. Hers had Tinkerbell. As for the boys we created a Captain Hook table. We accented their chairs with hooks, and made pirate hats for them to wear. 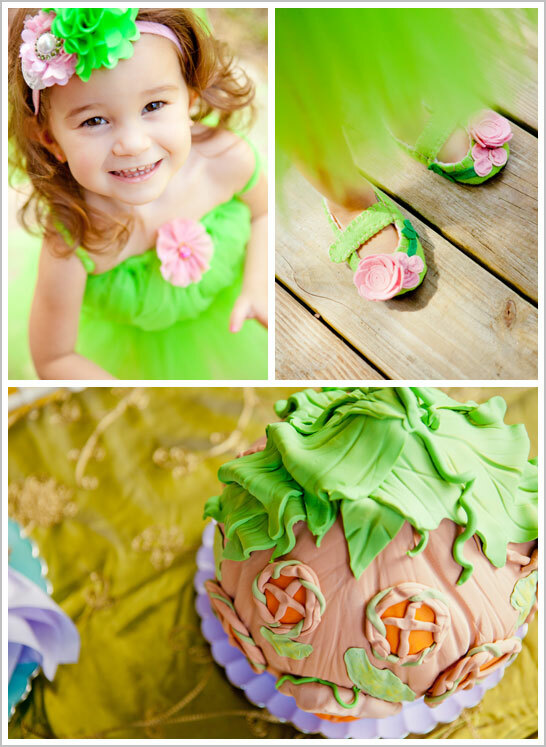 A huge thank you to Maylene of Malu Boutiques for sharing her daughter’s Pixie Hollow Birthday Party with us! It is simply delightful! This party is just adorable. I love the little popcorn bunting.. could not be any cuter! 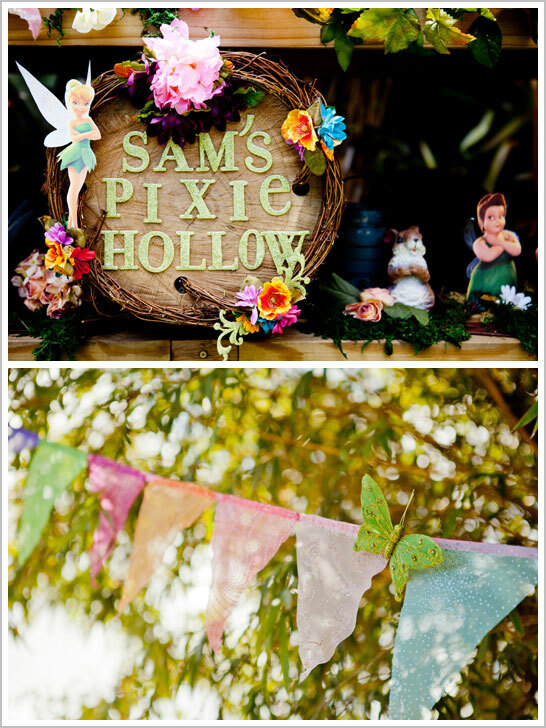 Thank you Carrie for featuring our Pixie Hollow Party!! Beautiful!! Love all details and that it wasn’t TOO commercial disney!! I want a party there!!! 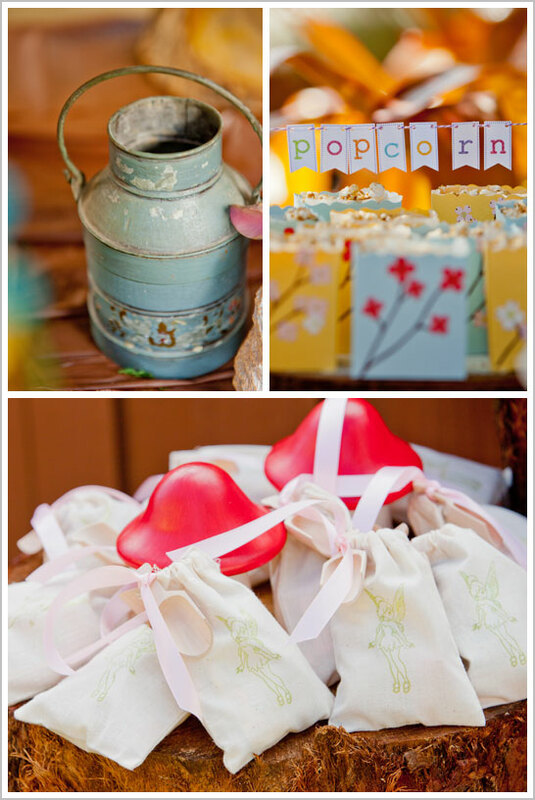 Very cute…love the popcorn bunting!!! where did you get the centerpiece? How can I make that? I simply adore your Pixie Hollow Sign. My daughter is named Sam too. Thanks for the inspiration , I ‘m creating one too.